I have to admit that I’ve never really understood the fascination many Elvis fans have with the man’s girlfriends. I know that lots of women, a few of them qualifying as “girlfriends,” cycled through Elvis’s life in the fifties, but can you honestly name one who had any influence whatsoever on his music or any other part of his career. I can’t think of any. 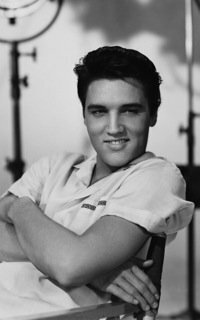 When considering Elvis as an important figure in mid-20th century American culture, the string of girls he chose as company through those years have no significance. 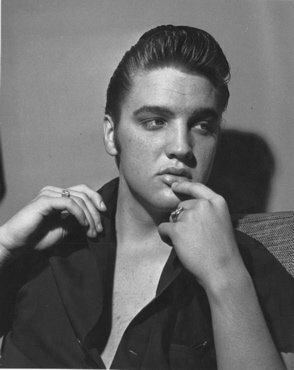 Of course, this interest in Elvis’s girlfriends is primarily found among his female fans. I’m sure most of his male fans are like me. We guys can’t relate to girls wishing they had been Elvis’s girlfriend. When I was a teenager, I liked Brenda Lee’s music, but did I fantasize about being her boyfriend? The thought never crossed my mind. Still, the subject of Elvis’s girlfriends pops up in the news, as it did in the Chicago Tribune on October 29, 2008. “Presley girlfriend cropped from history!” was the headline in the Tribunethat day. The story by reporter Jason George concerned a stage act then playing at Chicago’s Apollo Theater. Titled “Million Dollar Quartet,” the musical “tells the story of the impromptu 1956 jam session of Elvis Presley, Jerry Lee Lewis, Carl Perkins and Johnny Cash,” according to George. Most Elvis fans know about the event in question. 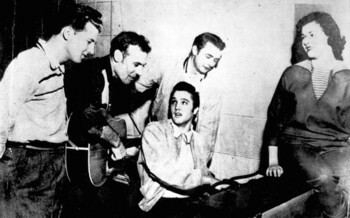 It happened on December 4, 1956, when Elvis dropped into Sun Studio in Memphis toward the end of a Carl Perkins recording session. 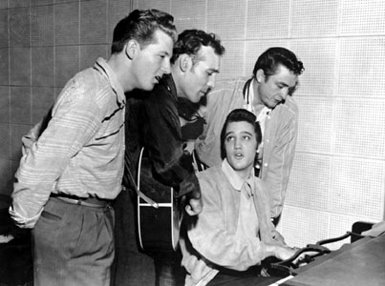 Lewis was playing the piano on the session, and he joined with Perkins and Presley for a jam session recorded by Sam Phillips. Johnny Cash dropped by long enough to get in a photo with the other three but did not participate in the jam session. OK, let’s just back up for a minute. The shadowy, “short-term girlfriend” in question supposedly was one Marilyn Evans. Her name has long been associated with the Presley myth, but only in a trivial sense. Peter Gurlanick gave her some credibility when he mentioned her in his 1994 Elvis biography. First, of Elvis’s November 1956 vacation in Las Vegas, Guralnick wrote, “He stayed at the New Frontier with his cousin Gene and attended all the shows. At the outset of his visit he dated Marilyn Evans, a dancer at the New Frontier, and invited her to come see him in Memphis in December.” Apparently, Miss Evans accepted Elvis’s invitation, as Guralnick claims she was in the car with Elvis a month later when he pulled up to Sun Studio in Memphis for the historic jam session. Here’s the problem—since that day, Marilyn Evans seems to have disappeared from the face of the earth. “She’s one of the few Elvis girlfriends to completely vanish into the ozone,” according to Colin Escott, co-writer of the Chicago play and author of Good Rockin’ Tonight: Sun Records & the Birth of Rock & Roll. Unlike many other women Elvis knew in those days, Marilyn Evans has never sold her story, appeared in any article, fanzine or made-for-TV movie, according to a statement by Guralnick in the recent Tribune article. Guralnick says that the only information about the girl was provided by “those there that day” at Sun Studio. That scant information about Miss Evans says that she was age 19, worked as a showgirl at the New Frontier in Las Vegas, and dated Elvis only for a few weeks. In his book, however, Guralnick gives no source for the facts about Evans or even that she actually existed. The author even admits that before Carl Perkins died, he insisted that the woman with Elvis that day had a different name. There were more than a dozen people in the studio that day, and still no one has been able to nail down who said what to whom about the mystery girl. • Is that Marilyn or Marion on the audio tape? Alledgedly, audio and visual evidence exists to verify Evans’s attendance that day at Sun. Halfway through the audio tape of the jam session, a female voice can be heard asking, “Would this rover boys trio sing ‘Farther Along’?” According to the Tribune article, the voice is believed to be Marilyn’s, but other accounts credit Sam’s secretary Marion Keisker with asking the question. From a historic point of few, the whole Marilyn Evans mystery is much ado about nothing. Even if she really was at that historic gathering at Sun Studio in 1956, she certainly would have been no more than a spectator. So why bring up an empty argument? For all those with a stake in the “Million Dollar Quartet” show at the Apollo Theater in Chicago, the answer is obvious. First of all, for wider audience appeal, the act needed a female presence (preferably a shapely blonde). Thus was born the character of Dyanne, played by shapely blonde Kelly Lamont. And she doesn’t play a fly on the wall. A photo in the Tribune shows her right in there with the boys, singing away and banging on her tambourine. And then there’s the hype factor. What better way to generate some publicity for the act than to trumpet the injustice of Elvis’s girlfriend being “cropped from history”? Update: Marilyn Evans, the mystery Elvis girlfriend who allegedly was with him at Sun Studio on December 4, 1956, for the “Million Dollar Quartet” session, has been found. Jason George of the Chicago Tribune interviewed her. His article about the musical act based on what happened that day finally flushed Miss Evans, now in her 70s, out of obscurity. I recommend you read George’s very interesting article about Marilyn Evans. "Unlike many other women Elvis knew in those days, Marilyn Evans has never sold her story, appeared in any article, fanzine or made-for-TV movie."